Charlotte Immenschuh knew first-hand the difficulties students had absorbing new concepts at school -- she was a math teacher who would see gaps in their knowledge every day. Even her daughter Lauren struggled scholastically, which is how she first encountered a Kumon Math and Reading Center. 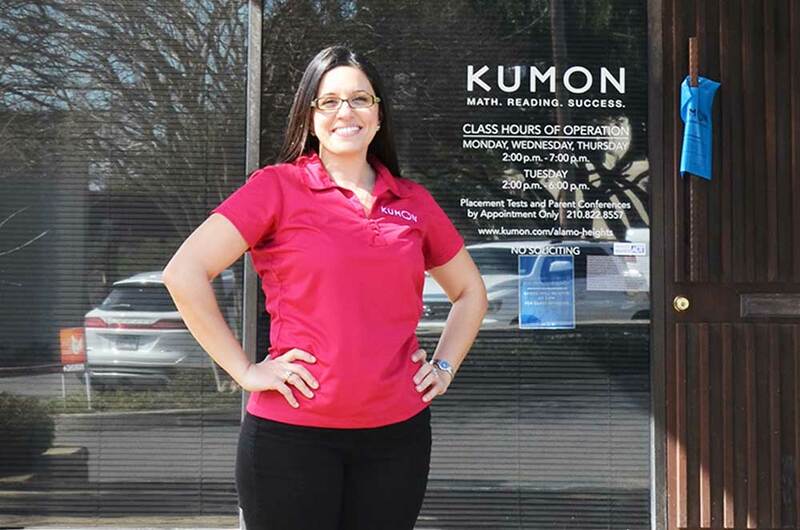 Seeing Lauren improve convinced Immenschuh of the program’s effectiveness, and she decided to combine her love of teaching with her business marketing degree to become a Kumon franchisee. Even now, 13 years after she first started the venture, she takes every opportunity she can to educate herself and improve her services -- and Kumon is there to help her. Read on and learn. My husband and I became familiar with the Kumon program when we enrolled our daughter, Lauren (now 22 and an elementary school teacher) in a local Kumon center. Like many parents, we began to notice a transformation in Lauren’s confidence, followed by her ability to grasp concepts in math and language arts with higher accuracy, as well as an ability to make connections from her Kumon assignments to classroom concepts. I was a high school math teacher in 2001, and learned very quickly that my students lacked in fundamental, rudimentary proficiency which perpetuated itself in upper-level mathematics. In a conversation, my husband suggested that I explore the possibility of opening an education franchise. He turned to me one day and said, “Charlotte, you have a background in business marketing and you’re certified to teach mathematics. Why don’t you take those two concepts and bridge them with a Kumon Center? You will be able to do everything you love and create something big.” I could see his point and felt it was valid. By this time, I was pregnant with our eldest son, Evan (now 13), and began to soul search to find the balance of being a mom and having a career. Kumon made more and more sense. Before opening my Kumon Center, I was a high school math teacher, specifically teaching in a credit recovery lab. Any student that had failed a math course had to come to me to earn their credit. This form of alternative teaching continued to validate my belief that many of my students simply lacked rudimentary, fundamental knowledge that was now creating a gap in their learning. In previous years, they were able to do enough to get by for that year and moment, but now the deficit was too much to "Band-Aid" per se. I began walking them through the basics to assist them in applying those skills to the coursework. I have a BBA with an emphasis in marketing, which was beneficial in analyzing the different programs on the market. As a Kumon parent, I already knew the program was effective, and as a teacher, I could see where the skills and methodology would be beneficial to students of all ages. I believed in the program and felt comfortable attaching my name to the Kumon brand. Upon evaluating a budget to open my center, my husband and I developed a tight budget of $25,000. The market in 2002-2003 was a bit more affordable than today, so when it was time to implement the budget, I was able to maintain on my modest investment. Kumon provided a number of financial incentives including a grand opening marketing subsidy. At the time of my opening, I also received signage and a rental subsidy of $700 per month. Kumon franchises are individually owned and operated, so costs related to expenses like staffing varies. Currently my employee salaries and wages comprise approximately 25 percent of gross sales.Within six months of my grand opening, the Center was profitable. I continued to reinvest monies over the next couple of year. In today’s economy, the current total investment needed to open a Kumon franchise is about $64,187-$134,100. Kumon a franchise fee of $1000, which is the lowest franchisee fee in the supplemental learning industry. Kumon currently helps with startup costs by offering a subsidy up to $19,000. Having recently graduated from college when I opened, I drew on my acquired skills from my BBA, my teaching experience and my husband’s career as a senior vice president with Merrill Lynch in financial advising. Kumon also provided continuous assistance in my planning. It offered a franchise seminar, which was a wealth of knowledge when developing my business plan. Additionally, I studied demographics, school curriculums and real-estate trends. I made a conscious effort to listen and take notes when testing potential students. Parents are an invaluable resource of personal experiences and what they see transpiring among a school’s culture. It is imperative to keep current with the trends in education, as well as your own personal continuing education. Learning the program was the most challenging part because you have to learn to adjust lesson plans effectively to ensure each student is accommodated to foster smoother transitions. Our students are our best teachers, as they enlighten us with better ways to implement the program, and those lessons can only be learned in time. Running a business brings several challenges, especially in finding the right staff. There is a tremendous amount of ongoing training that should be done with employees. In addition to staffing, there are always learning curves for finding the right accounting programs, learning about taxes, city requirements, leases and many other daily business functions. As overwhelming as it can be, once you find what works for you it becomes second nature. I am still 100 percent hands on in the financial happenings and operations of my center, and that is something that I would encourage all center owners to keep abreast of. Marketing within the Kumon organization has come a long way, and I feel it provides strong support on a national level. Regionally, we are responsible for our own marketing efforts. Figuring out what works best in your area takes time and consistency. I would encourage individuals to explore the possibility of owning a franchise. Kumon has been a good fit for me. It is supportive on a corporate level, but more importantly it is involved with your center in a close manner. Owning a franchise allows an individual to grow a brand as big as they desire within their area, while providing a sustainable program or product. I plan on continuing to use the resources that Kumon provides in order to succeed. I regularly attend annual conferences and monthly meetings for franchisees, which provides me with tools, such as national trends, that I can integrate into my center. I also believe very strongly in continuing my education to be of better service to my students and community, and will be completing my masters of education in curriculum and instruction with an emphasis in equity, ethics and justice in April 2016. I will be pursuing a PhD as well. My students inspire me to be a better person, and together we are building a stronger community.